This time last week I was getting very excited because we had been given the ok to go and meet a little Westie puppy! We had been looking around for a while for puppies but the thought of getting an 8 week old puppy was a little daunting. I had never looked after such a young puppy before! Growing up, we always had dogs around us. My first dog, Tess, was a mixed breed and lived until she was 17! We then had Nesbitt, the retired greyhound and when Adam and I got our first house, we rescued a 6 year old Westie called Winnie. Winnie now lives with Adam’s dad, who spoils her rotten! We came across a breeder who was 2 hours away in Florida. 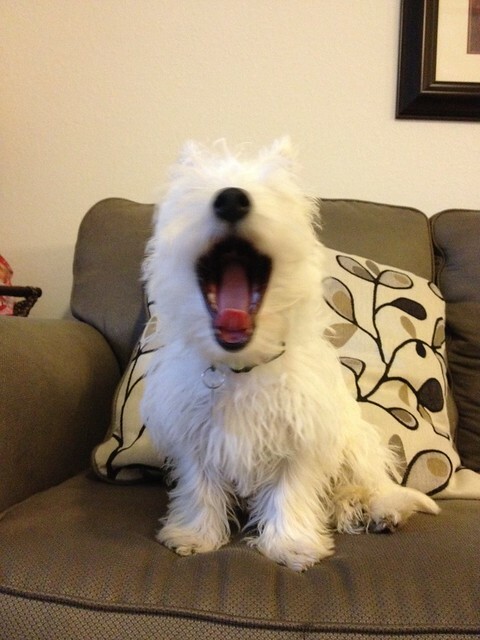 She posted about an older Westie puppy (15 weeks) who had been returned to her because she was too much like a ‘puppy’. We were told that the puppy was too much for the previous owner to handle so she kept her in a crate all day. When we saw the little puppy we could tell that she had been confined because her paws and legs were stained from being in her own mess 😦 This made me very sad. We knew that she would take just as much work as a young puppy but I’m in the position to do that at the moment. When we arrived, Maisy came straight to us and fussed us so much. She let us both pick her up and then jumped up at us when we put her down. Needless to say, she came with us! 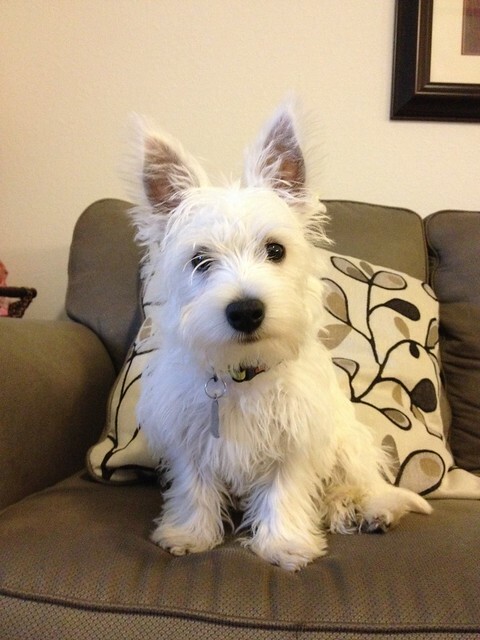 Westies are my favourite breed of dogs ever! They are so loyal, have great characters and are super cute! We both love her so much already! She makes us laugh and makes my heart melt. 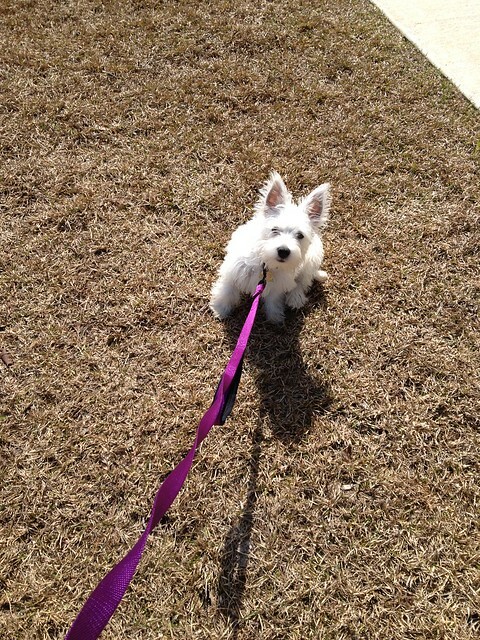 As cute as she is though, puppy training is hard work! We are still working out her toilet routine and I know that when she does have an accident, it’s our fault for not being attentive enough. The first few days were tricky and my patience was tested. I was taking her out every few hours and she would just sit and look at me. Sometimes, I was outside for 45 minutes before she did anything. For the last few days though, she has been brilliant! She is also walking on her lead calmly and has been fine when meeting other dogs! Hoorah! 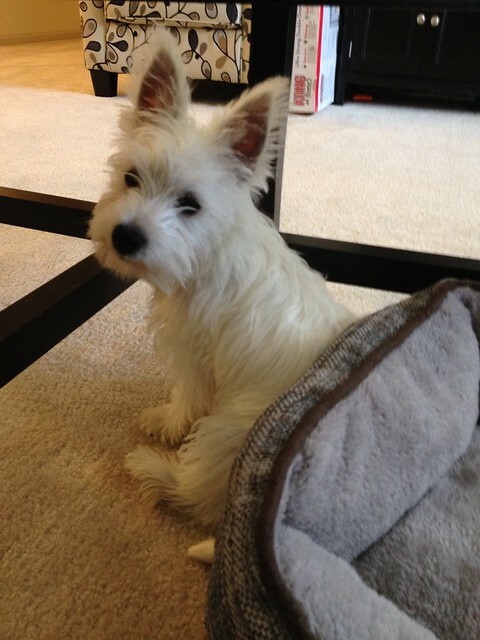 We also tried crate training She was great the first night…but the second night was a nightmare. She was howling, shaking the crate and crying loudly. I think I would have had more willpower if we weren’t on the bottom floor of our apartments. 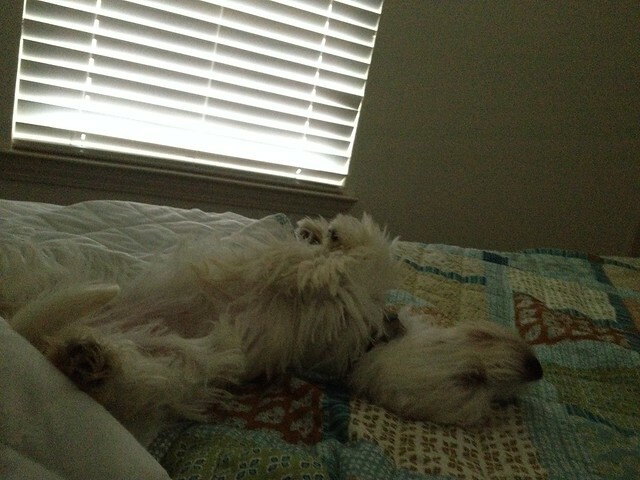 After an hour, we took her out and put her on the end of our bed…and she slept the whole night through without any problems! Adam leaves early for work too so once he’s gone, she comes up for cuddles! 🙂 I have now moved her crate into our living area hoping she will choose to go in on her own because I still plan on putting her in there if we have to leave her alone in the apartment at any time. Oh, such a sweetie. I’m so happy for all of you. Pet friends are the best! She is adorable. Maybe she associates the crate with being left. Thanks 🙂 She always has that “Are you talking to me?” look on her face…very funny! She is so adorable! I agree that puppies are hard. When our dog was a puppy it seemed very difficult but it was only a few weeks and then everything fell into place. Poor little doggie-I bet she does associate her crate with being left and bad things. Our dog sleeps on our bed too 🙂 But I see why you would want to have the crate available. We used a crate too, and we put a baby gate up to close off the kitchen and keep her in the kitchen when we left the house. That way she wasn’t shut up in the crate, but she couldn’t have an accident on the carpet. She is adorable! You took some great shots of her too! I’m sure it is difficult for the first while but she looks like she’s worth it! She is a complete sweetheart. 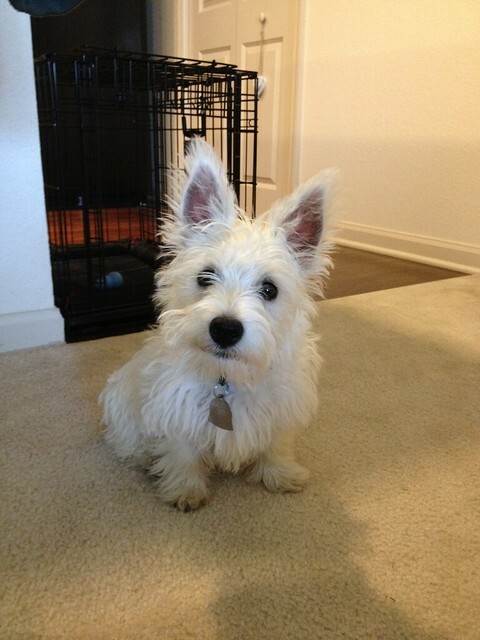 Congratulations on your little westie! Thanks 🙂 She has a lovely character and seems to be settling into a routine more now!